Lisa Steltenpohl, the newly appointed Principal Viola of the Baltimore Symphony Orchestra, is a graduate of The Curtis Institute of Music and The Juilliard School. 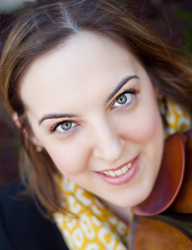 She has served as principal violist of The Curtis Symphony Orchestra and the Haddonfield Symphony, now Symphony in C. Ms. Steltenpohl has also performed with such ensembles as The Philadelphia Orchestra and The Chamber Orchestra of Philadelphia. She began her musical studies on viola at age 11 and while a student in high school was one of the youngest members of the Civic Orchestra of Chicago. Ms. Steltenpohl made her Orchestra Hall debut performing Bartok’s Viola Concerto with the Chicago Youth Symphony Orchestra in 2001. In addition to her orchestral career, she has participated in many chamber music concerts and festivals, performing alongside notable musicians such as Arnold Steinhardt, Leonidas Kavakos, and others. Most recently she was heard playing Mozart’s Sinfonia Concertante with the Baltimore Symphony Orchestra in October, 2015. Originally from North Barrington, Ill., Ms. Steltenpohl comes from a musical family. She and her twin sister Anna, oboe and English horn, have been featured on the educational series “Musical Encounters” and have performed many recitals together highlighting the viola and oboe repertoire. Prior to joining the Baltimore Symphony Orchestra, Ms. Steltenpohl was a member of the Rochester Philharmonic Orchestra. Her teachers have included Misha Amory, Roberto Diaz, Desiree Ruhstrat, and Stephen Wyrczynski.